Pioneer Christmas - Thank You! During this season of giving, I would like to say thank you to our donors, members, and volunteers. 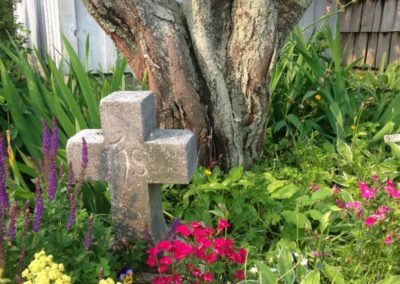 Your generous donations of time, talent, and treasure supports the various programs that we offer at both Historic White Pine Village and the Port of Ludington Maritime Museum. Thanks to your continual and generous support we were able to host the 1st Annual Pioneer Christmas this past Saturday. This event merged the past and the present traditions that we all cherish and spread “Christmas Joy” to almost 800 people. Thank you for supporting the Mason County Historical Society. Thanks to your generosity we are able to provide educational programming opportunities such as Pioneer Christmas! We are grateful for your generosity, trust, and most importantly your commitment to our mission. • This is awesome! The true meaning of Christmastime! • Great night. Looking forward to next years Christmas at White Pine Village. • Had a great night with our family there,thanks to everyone that made this possible. Looking forward to next year and Merry Christmas! • It was magical! Thank you to all those that made it such a fun night. Thank you for partnering with us on this fun festive event! As we embark on the holiday season I would like to take a moment to thank you for your continual support throughout this past year. We are truly grateful for your commitment to our mission! 2018 has been a busy and exciting year for both museums. Historic White Pine Village saw a 12% increase in admissions this year and a 40% increase in gift shop sales compared to two years ago. The Village was bursting with excitement as our first person interpreters entertained our many visitors. Our visitors were also able to enjoy our newest village exhibit — The Mason & Oceana Railroad exhibit which opened in July — thanks to our amazing donors, members, and volunteers. As visitors returned to the admission building on their way out they shared delightful stories of their time spent out on the grounds, taking in the nostalgia of our area’s past. Port of Ludington Maritime Museum enjoyed its second year of operation and brought in a steady flow of visitors. In addition to the spring and fall hours, the museum was open seven days a week from Memorial Day – Labor Day thanks to the dedication and hard work of our staff and volunteers. Our volunteers shared their wealth of maritime knowledge with the thousands of visitors that walked through our doors. We opened the SS Badger exhibit on the third floor and are in the process of installing the U.S. Coast Guard exhibit. We have also begun exhibit design work on multiple exhibits that will portray the rich history of the lumbering, life saving, salt manufacturing, boat building, and commercial fishing industries that helped innovate our beautiful area. Thanks to the support of our generous donors and members all three of these exhibits will enhance the visitor experience as we share with them the remarkable history of our community. I hope the news of our successes gives each of you a sense of pride. Your commitment to our mission pays honor to those that have gone before us who worked tirelessly to create what I like to call “majestic” Mason County, Michigan. Thank you again for your support of our organization. 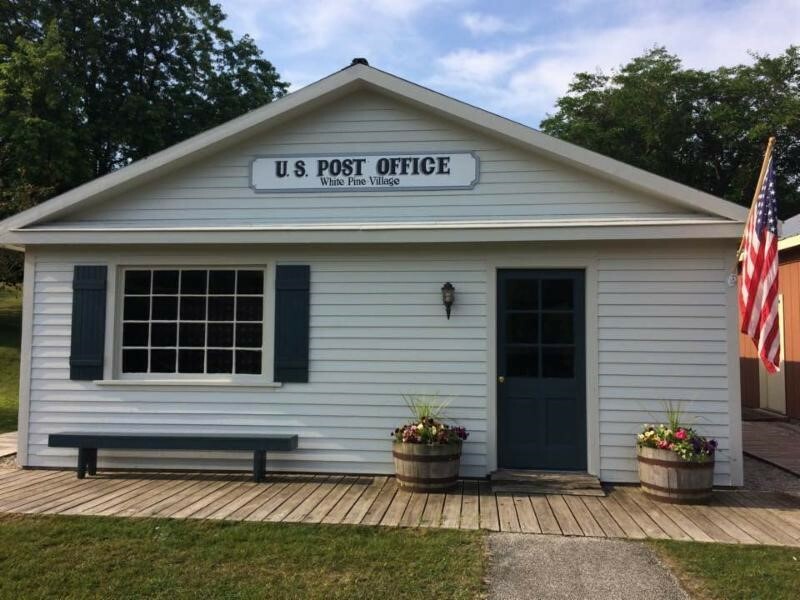 We take great pride in our mission and our accomplishments, and thanks to your support we will be able to continue sharing the remarkable history of “majestic” Mason County, Michigan! Historic White Pine Village will host trick-or-treaters on Saturday, October 20th, from 3 p.m. to 6 p.m. This family-friendly event is geared toward children of all ages. This event has become a huge hit with families! Each year the Mason County Historical Society gives out over 15,000 pieces of candy to over 500 kids. Admission prices are kept low so that families can afford to come and safely trick-or-treat. We are in need of sponsors and/or donations of candy to hand out to the many trick-or-treaters and their families. Sponsors are recognized on our Daysheets, social media pages, and website. Each family receives a Daysheet with a map of the Village on it. Donations can be delivered to the Village on Tuesday through Saturday from 10:00 am – 5:00 pm. My wife and I were in Coopersville to get some railroad rails for an exhibit at the PLMM when we saw this huge thing covered in shrink wrap. Our guide from the Coopersville and Marne Railroad explained to us that it was a steam engine they had rescued from the scrappers. And it needed a home. I was immediately struck with the idea that the perfect place for it was Historic White Pine Village. 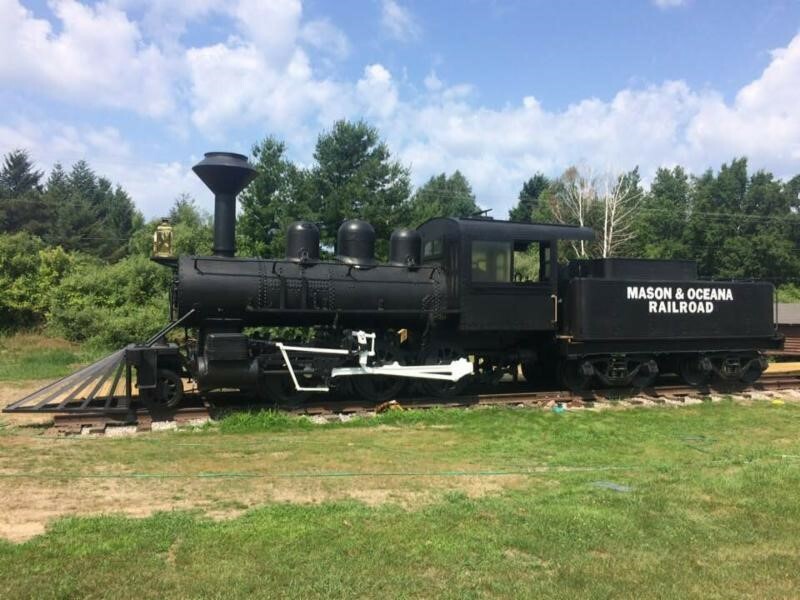 The railroads built Mason County and developed it to what we have today, but nowhere do we pay homage to all important part they had in developing West Michigan. Our 1st Person Interpreters and additional volunteers will be on hand to share the history of folks living in Mason County’s pioneer-era. The Town Hall will be selling snacks, pop, water and ice cream! 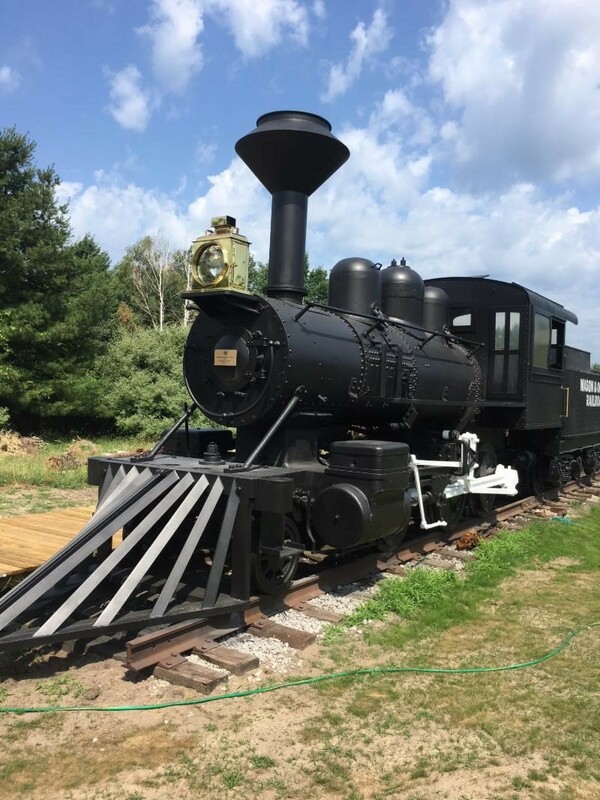 The latest exhibit to be opened at Historic White Pine Village is a restored locomotive similar to some of those that were operated by the Mason & Oceana Railroad from 1886 to 1909. The M & O Railroad, frequently referred to as the “Miserable & Ornery” by the men who worked on her, was a narrow gauge (3 ft. between the two tracks) railroad used by lumberman Horace Butters and his family to haul logs to the sawmills located on what is now commonly called the Buttersville peninsula. While the M & O was primarily built to haul logs to the sawmills in Buttersville, it also hauled freight and passengers to and from various locations in Oceana County. Some of those passengers were baseball teams, one sponsored by the M & O itself, as recorded in the May 20, 1897 edition of the Ludington Appeal. 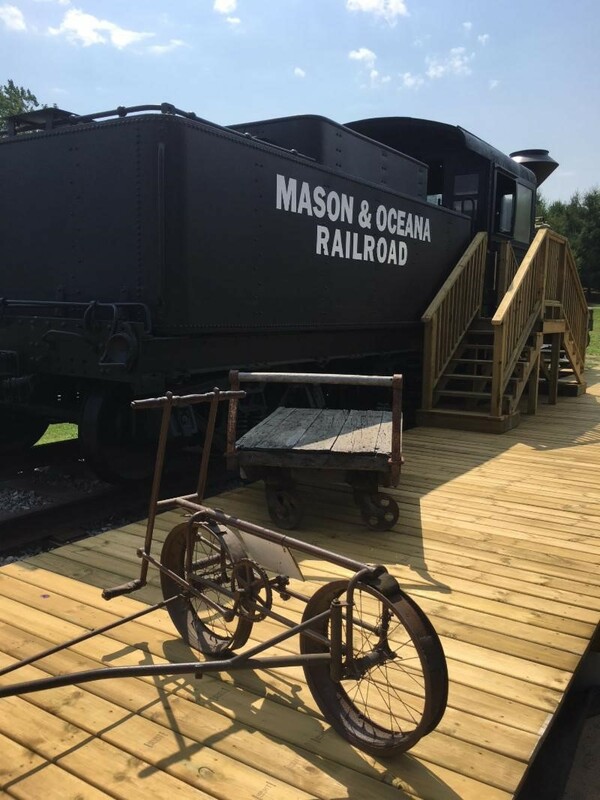 The Mason & Oceana Railroad Exhibit Dedication ceremony will be held at 1:30 p.m. 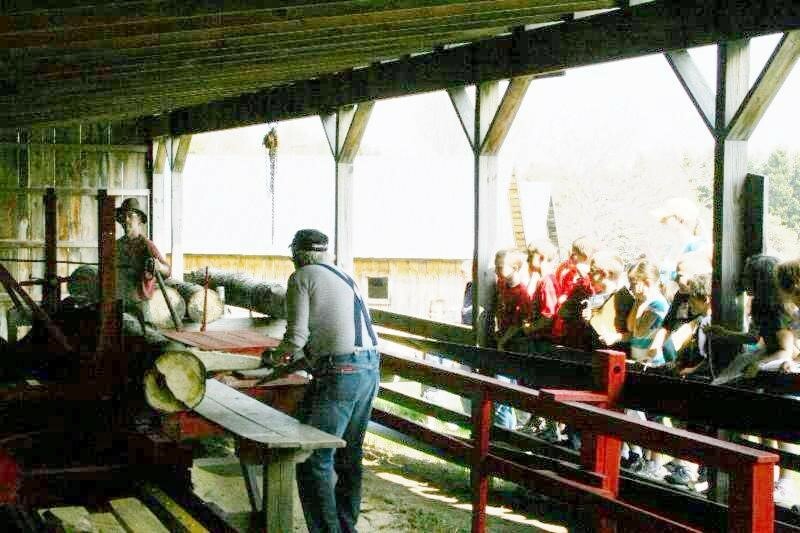 Following the dedication the exhibit will be open to the public and volunteers Gary & Josh Powers will run a sawmill demonstration. The Ludington Mariners are hosting an Old Time Base Ball tournament that will begin at 10 am and will run until a champion team is declared! There will be three team competing: Ludington Mariners, Sydney Stars and the Fallasburg Flats. Mason County residents will be allowed free admission – with a valid driver’s license only. You must show your ID for free admission. For all others the cost of admission will be $5.00 for the day. Youth ages 5 & under are free. 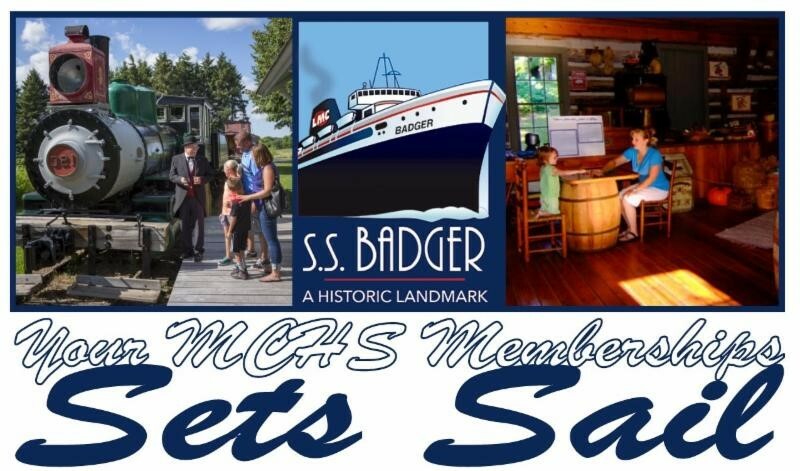 Members of the Mason County Historical Society (Ludington, Michigan) and the Manitowoc County Historical Society (Manitowoc, Wisconsin) will enjoy free daily admission* at each other’s historic villages during the 2018 S.S. Badger sailing season. The Badger will set sail for its 2018 season from May 11 to October 14, joining our historical villages with a route on a National Historic Landmark. *Free admission upon presenting your membership card. Share your trip photos with us! Whether you are enjoying the crossing on the historic S.S. Badger, or taking in an adventure at a historical village-we want to follow your journey. We encourage you to share your photos with your local historical society or #MCHSsails on social media. 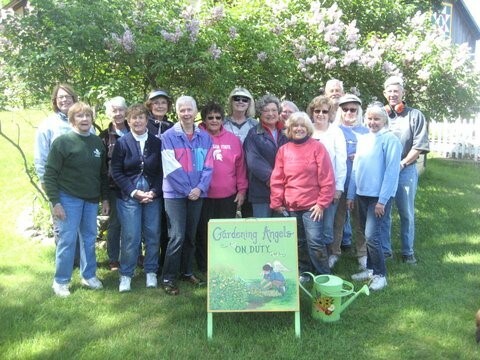 Every Tuesday morning at Historic White Pine Village, you will find a group of volunteers we affectionately call “Gardening Angels”. 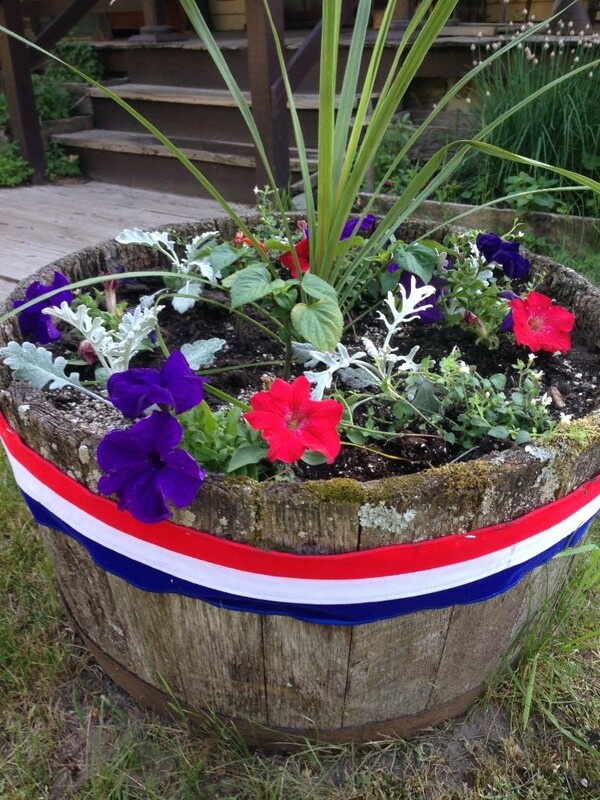 These ladies and gentleman maintain the flower beds, vegetable gardens and flower pots on the Village grounds. 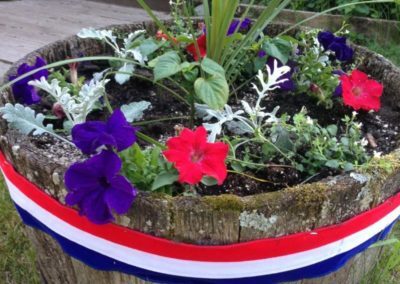 They plant, weed, water, mulch and fertilize as needed. 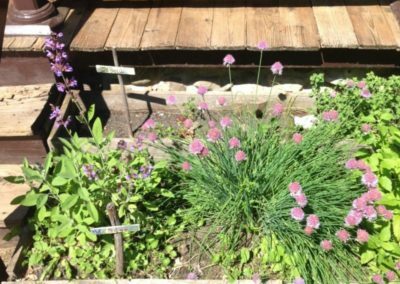 The group tries to keep to heirloom, and historical plantings. They spend the morning gardening and have lunch on the grounds. 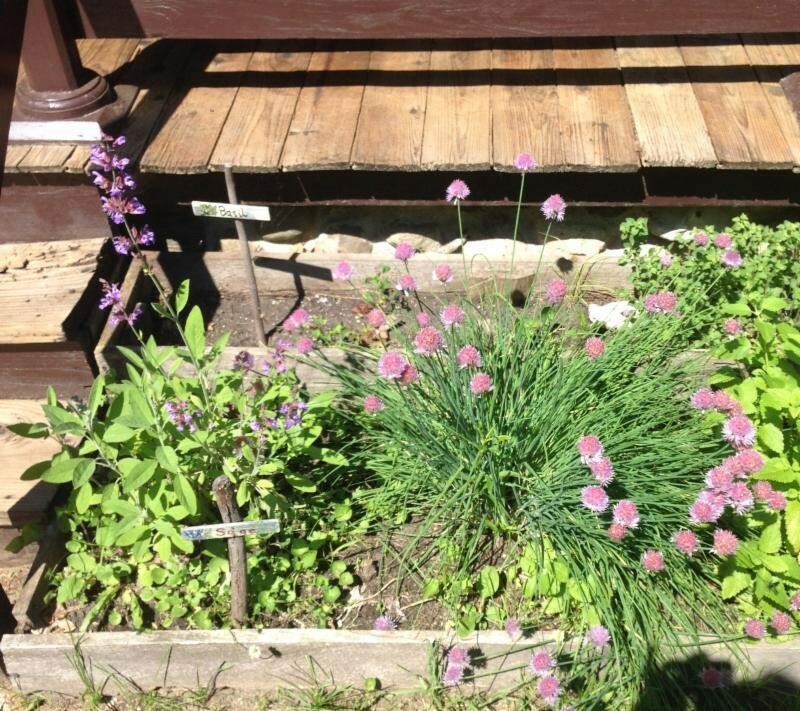 This year, our group is participating in the “Grow a Row” program in our vegetable garden. Partnering with the Lakeshore Resource Center, (www.lakeshoreresourcenetwork.org) they have planted an extra row of vegetables to donate to the center. 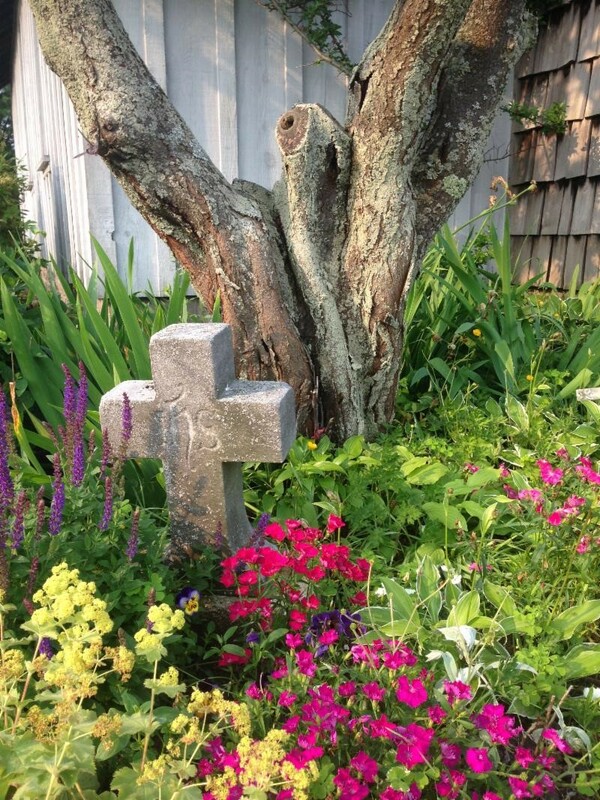 Below is a sampling of the gardens they maintain at our Historic White Pine Village. They are always looking for more volunteers! Our Post Office received new paint and new signage from our Adopt-a-Building Program. Thank-you to everyone who participated in last year’s Adopt-a-Building program! This program helps with the upkeep of our 30 exhibit buildings. For the first time in the last 20 year history of the Adopt-a-Building program; we are asking for a donation of $750.00 per building. We are asking for this increase in order to keep those historical buildings in good repair and provide visitors with a well preserved, educational and historically accurate taste of life lived during the pioneer era! New long-lasting steel roofs on the schoolhouse and Research Library. At this time, we do not receive tax based support. Museum admissions and gift shop sales account for only 45% of our budget at the Village. 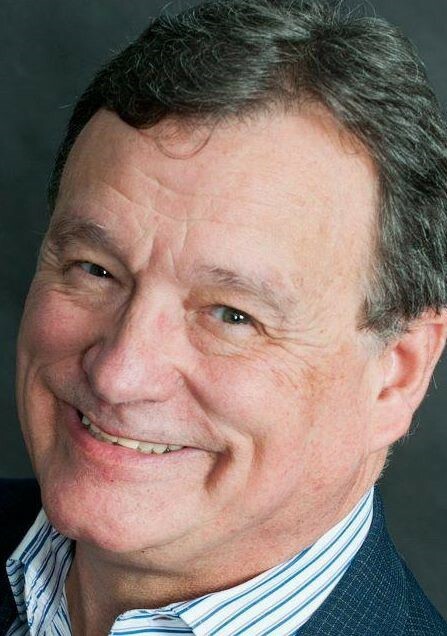 The remainder needed to cover operating costs comes from generous supporters such as yourself; by supporting Adopt-a-Building, Business Partners, becoming Members, supporting special events, and our Annual Fund drive.